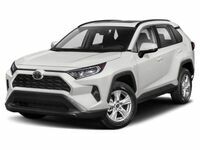 Next year will see the Toyota RAV4 model’s first-ever Toyota Racing Development trim level, but last year the brand started to sate our appetite by introducing a different adventurous special edition trim level. 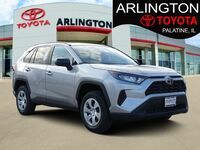 It returns this year as the 2019 Toyota RAV4 Adventure in Palatine IL, and remains one of the best off-road options on the lineup (without the TRD Off-Road or TRD Pro nameplate attached, that is). The Toyota RAV4 has been around since all the way back in the early ‘90s, when it was introduced for the 1994 model year. The RAV4 Adventure grade was actually introduced as a concept vehicle way back in 2013, at that year’s Geneva Motor Show. It took a few years for it to be translated into a production model, which finally happened for the 2018 model year in September ’17. 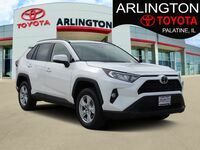 The RAV4 Adventure has plenty of ordinary features found on other trim levels, such as Toyota Safety Sense 2.0, a 7” Multi-Information Display in the instrument panel and the available 8” display audio screen featuring Entune 3.0 multimedia system. Most of what sets the RAV4 Adventure apart is its unique design cues, including a more aggressive grille, bigger overfenders, exclusive roof rails, 19” five-spoke alloy wheels and more. On the inside, the seats feature a unique, rugged pattern and orange accents to further set it apart from other RAV4 trim levels. There are some unique features as well to the RAV4 Adventure, certain ones that you can opt for and other that are standard. For instance, you can choose to add heated and ventilated front seats, a heated and leather-trimmed three-spoke steering wheel, a leather-trimmed shift lever and the digital rearview mirror that features HomeLink among others. To learn more about the 2019 RAV4 Adventure, be sure to check out our blog and other parts of our website. Also, don’t hesitate to get in touch with us right here at Arlington Toyota with any questions you might have! If you think you’re leaning toward a RAV4 Adventure of your own, be sure to schedule a test drive here on our website for your earliest convenience. 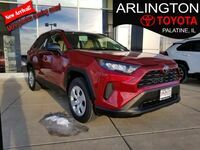 Interested in a Toyota RAV4?